I’ve put together a quick video showing off the loot we pulled together at the Apple Store opening. Made mostly late at night, so it came out a bit strange, but feel free to comment. Here at TheiLife, we are beginning to plan some tutorials (ie, Screencasts) for release in the future. Before we make a move on some subjects that we think our readers might like- it would be awesome to actually hear from you! You can email us, or leave a comment below. Help us help you! Thanks!! 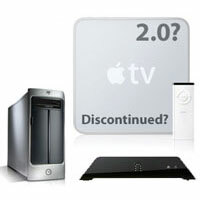 The speculation is now behind us: the Apple community has confirmed that the Apple TV was not a success this year, selling approximately 400,000 units. Some blame it on the hardware or the lack of iTunes video content, but the real issues with the Apple TV and other “Media Centers” are the consumers. At this point in time, television is in a different arena from computers and the internet’s digital content. Television has dominated home entertainment for decades and not until recently, the last 5 years or so, are computers beginning to play a large role in media consumption. Like MP3 players in 1999 that attempted to bring digital music away from the computer, ‘Media Centers’ haven’t taken off. So where is the iPod of the ‘Media Center’ industry?